In past few years we have been noticing a negative inclination in demand of station wagons. The major reason behind this can be considered the hike in popularity of crossovers. Well at the Frankfurt Motor Show 2015 Vauxhall took the gleam to break the trend by presenting Vauxhall Astra Sports Tourer 2016. The model comes loaded with some superior safety features and tech gadgets amidst the comfortable and spacious interior. 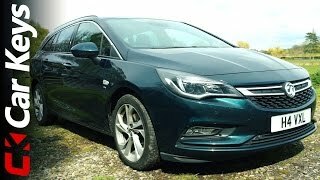 Let us have a look at the review of Vauxhall Astra Sports Tourer 2016 to learn more about its specifications and performance figures. The interior of Vauxhall Astra Sports Tourer 2016 is quite a similar to the hatchback company unveiled in the same motor show. Starting with the cabin center console gets a bit more appealing looks in comparison to the model it replaces while a larger digital display finds its way over the same place. Even the sitting has been made comfortable, let that than be the upholstery or the comfort in all. Mounted over the dash, right in front of the driver is a three-spoke steering wheel that hides behind it digital display that is comparatively larger in size while the steering spokes get the brushed-metal finished that give it a remarkable touch. Talking about the space, there is enough space inside the model and can easily house you and the cargo, offering a joyous ride. In all the interior of Vauxhall Astra Sports Tourer 2016 is a remarkable piece of engineering and design that offers you comfort and technology both. The exterior of Vauxhall Astra Sports Tourer 2016 is based on the design philosophy where ‘Sculptural Artistry meets German Precision’ (as narrated by the company officials). The dimensions are almost the same however you will undoubtedly notice changes in the design. Starting with the front fascia it has a newly designed grille adorned with dual chrome bars that mark their way till the headlights. Talking about the LED headlights, they too get a bit of ‘new touch’ with that resembles to drowsy eyes, however once lighted I’m sure they will give the touch of aggression. Moving towards the rear end of the model you’ll notice the creased shoulder lines along the sides while the rear section is commendable amalgamation of design and especially the technology. The reason behind the statement is the integration of keyless tailgate. The system through its sensors can open the tailgate with a small kicking motion beneath the rear bumper; this means you can now easily open the tailgate with all that cargo in your hand or the bottle of some soft drink. 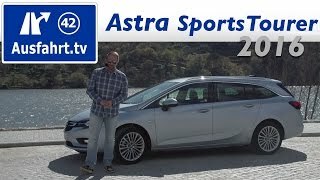 Thus rounding up the entire exterior details of Vauxhall Astra Sports Tourer 2016 I would say it is worth a try. Though nothing much has been disclosed in terms of the output of Vauxhall Astra Sports Tourer 2016 but we do know that in all there will be six powertrain options beneath the hood of Vauxhall Astra Sports Tourer and each of them commendably providing the wide range of feasibility to its all types of buyers. 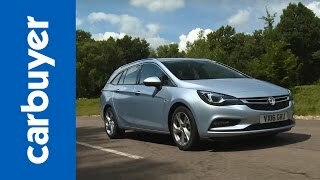 Talking about the performance figures of Vauxhall Astra Sports Tourer 2016 I would request bit of your patience as we would update it as soon as the company shares the same.